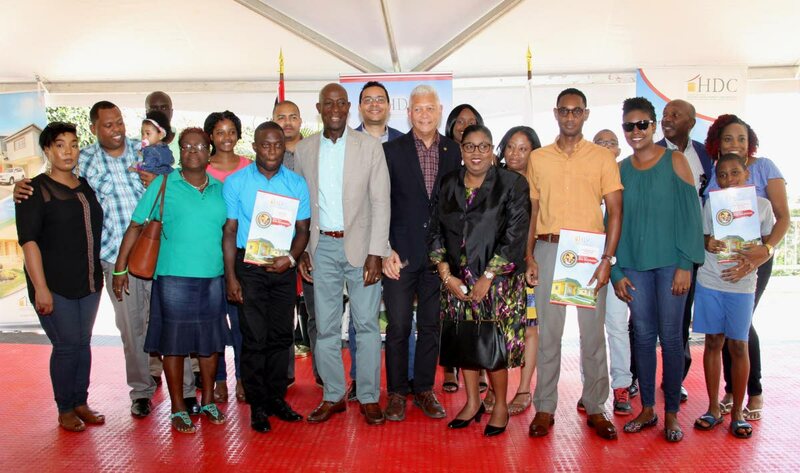 Prime Minister Dr Keith Rowley yesterday blamed politics in the PNM administration of Patrick Manning for triggering the 12-year delay in the construction of the Vieux Fort housing development in St James. This project began in 2006 when he turned the sod as housing minister. It was halted, along with others, when a colleague reported to Manning, the prime minister, that there was a discrepancy in the Cleaver Heights project in Arima, and $10 million was missing, leading to Uff Commission of Enquiry into construction. The Vieux Fort project on Bass Street, St James never resumed as the PNM lost the 2010 general election and the People’s Partnership (PP) government did not complete it during their five-year term. The PP too had to share the blame for the long wait for people to get houses, he said. “I had passed this street every day going east and passed on the highway on the foreshore going home in the afternoon and I would look at this project and I would think of the 137 families that could have been living here if the governance of Trinidad and Tobago was different. One hundred and thirty-seven were denied access to urban improvement and houses because politicians from Trinidad and Tobago on both sides did what I just told you,” Rowley said. The Prime Minister raised the issue to correct Housing Minister Randall Mitchell who had earlier said the project was delayed due to the UNC-led PP. “And you know the painful part about that, the one from my party lives under a stone somewhere and every so often appears out of the stone to criticise as former minister and the ones who left it here for five years and did not put a stroke for five years are still in the Parliament asking the current government what you borrowing money for,” Rowley said. He said handing over the keys to home-owners was him “finally laying down my burdens”, adding a lack of good governance was the sole delay. He added that he almost missed the opening but was glad he attended as it was a burden on him. The incomplete project represented all that was wrong in the country he said with a lot of potential, good and bad. He encouraged those gathered to relive the good, realise the potential and do away with what is wrong. Rowley said political friends and opponents can do wrong and the Vieux Fort was a political casualty, which fell prey to politics in the PNM. Phase one, which was handed over yesterday, cost $44 million and consisted of 44 three-bedroom homes. The project is expected to be completed this year and will house 137 families. Rowley said the homes should be taken care of and not denigrate into a “ghetto”. He said the apartments are gifts from the State and the home-owners should accept the $650,000 apartments as such. He criticised the past regime for spending millions of dollars to acquire private lands well above market value in central Trinidad when the money could have been used on the project which needed $113 million to complete. He recalled other issues that hindered the completion of Vieux Fort which included a legal argument that the land was home to agoutis and was occupied by a squatter who had to be removed by the court. In his address, Mitchell said the 137 families to be afforded homes, included members of the protective services and they have been placed in the community to add a measure of safety to the area. Later this year the ministry, he said, will launch the housing construction initiative programme which will offer a $100,000 incentive on each house built by private developers who use their own resources to complete the units. Member of Parliament Marlene Mc Donald reminded the homeowners to pay their mortgage as the monies will be used to construct other homes. She welcomed them to her constituency reminding them that after three months of living there they are legally bound to vote in the Port of Spain south constituency. Mc Donald, who was fired as housing minister in March 2016, told the residents that they are fortunate and blessed to have received their keys. She was recently appointed a minister in the Ministry of Public Administration and Communication, after a one-day stint as public utilities minister.